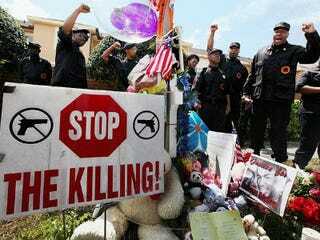 As George Zimmerman continues to walk free in the shooting death of Trayvon Martin, the New Black Panther Party has decided to take matters into its own hands, according to the Daily News. The party is offering a $10,000 bounty for the "capture" of the Florida neighborhood-watch captain who shot the unarmed 17-year-old. Leader Mikhail Muhammad described the situation as "an eye for an eye, a tooth for a tooth," after announcing the reward for Zimmerman during a protest in Sanford, Fla.
"If the government won't do the job, we'll do it," Muhammad said, calling on 5,000 black men to mobilize, leading protesters to chant "freedom or death" and "justice for Trayvon." The New Black Panthers say that the newly appointed special prosecutor in the case, Angela Corley, is an enemy of the black community. "She has a track record of sending innocent young black men and women to prison," Muhammad said. The group also accused Sanford city officials and the governor of Florida of lying and delaying justice. The party is reportedly taking donations from black entertainers and athletes and hopes to collect $1 million by next week.